Zip wire. Plummeting along for a mile at 100mph, half a mile high. Zip wire experience. What is it? 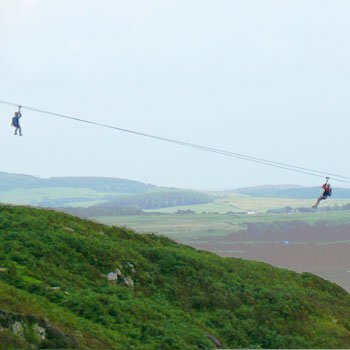 This is the very best zip wire experience in the UK, and the only one we’d recommend. It makes the others look tame in comparison. It’s the longest in Europe, so people come from all over just to frighten themselves to death. It’s a high, very high, steel wire a mile long, and you hang from it and career downhill, in mid air, reaching speeds of up to 100 miles an hour. It’s at Bethesda in Gwynedd, North Wales, but we can tell you in no uncertain terms that it is worth the trip. The ride of a lifetime, the adrenaline experience to end them all, something to tell your grandchildren about. There’s just the one experience, sometimes known as the Big Zipper, but it’s sold by a number of the major experience merchants. We deal only with the top, most reputable ones who give value for money and care about giving you a good time. And we check their prices daily, ever on the lookout for bargains. So here they all are listed for you below. They’re all the same – the only difference is one person or two – so check out our list and buy the cheapest. You’ll need sturdy footwear and warm gloves, and 100mph high over the ground can get quite chilly – though the fear factor may warm you up!! Anyway, when you’ve finished the little zipper and are thinking how good it was and how brave you are, it’s into the specialist vehicle and up, up, up to the top of the Big Zipper run. You’re reassured (you won’t need reassuring – will you?? ) strapped in, and with a cry of Geronimo!!!! it’s away you go into space with only a wire and harness protecting you from certain death. The people operating it are good – very good – and will make sure that you’re totally safe even while frightening yourself half to death. It’s the ride of your life, something you’ll talk about long after the hairs on the back of your neck have stopped standing up and you’ve changed your underwear. At almost stocking-filler prices, this is something you can give to friends, relatives, other halves, boyfriends, girlfriends, even people you don’t like very much. Or a favourite is to get a gang from the office or club and go together to see who is hard, who bursts into tears at the top and cries for their mother, and have great fun laughing at and filming each other. Just don’t buy it for your granny. Or perhaps do buy it for your granny, as she won’t want to do it and will give it to you so you can go yourself. That way you’ve bought granny a present and you get all the benefit! Zip wire experience – ultimate exhilaration5Sarah FirminZip wire. Plummeting along for a mile at 100mph, half a mile high.